Devon contemporary beach house with hot tub and 4 bedrooms, sleeps 9, ideal for groups or big families includes parking, WiFi and smart TV. 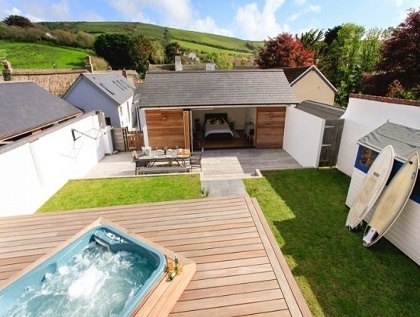 This self-catering Croyde holiday home sleeps 9 people with a sofa bed in the sitting room which can accommodate 2 extra guests. The house is situated in the heart of Croyde village just a short walk to the shops, pubs and beach. More award winning surfing beaches include Saunton, Putsborough and Woolacombe, all just a short car journey away. Relax and make yourself at home in this unique holiday home. The sitting room has comfortable sofas seating 9 people. Enjoy use of a wall-mounted 40" smart TV (BT youview) with Blu-ray player and 5.1 surround sound and inclusive WiFi internet access. Underfoot enjoy luxurious underfloor heating throughout the ground floor and the added luxury of iPhone/Bluetooth linked speakers in the dining room and kitchen. There is an additional reading corner in the dining room with bookshelf and selection of books. Cooking will be a pleasure in this ultra-modern kitchen. Appliances include a triple oven, induction hob and dishwasher, microwave, toaster, kettle, cafetiere, bread maker and a selection of quality pots, pans, crockery and cutlery. There is a washing machine in the hidden panel in the lounge.The kitchen joins onto a large dining room seating 10 people, perfect for family lunches or dinner parties. A high chair is provided. The dining room also has a wall mounted 32" smart TV. Bedroom 1: Master bedroom (ground floor level access from parking and garden, one level up from lounge and kitchen) with king-size bed and large en-suite wet room. Ceiling mounted flatscreen TV. A hairdryer is included for your convenience and a Bluetooth sound system enables streaming of music to the outdoor areas. Bi-fold doors open out onto a large decked terrace and the rest of the garden, with views over the hills beyond. Bedroom 2: Double bedroom with super king-size bed and boutique chest of drawers (can be two single beds upon request). A hairdryer and Bluetooth sound system are provided for your convenience. Bedroom 3: Bunk bedroom with antique dresser and picture window. Bedroom 4: Triple bunk bedroom (double bed below, single bed on top) with chest of drawers and a picture window. The room also includes a wall mounted flat screen TV. Bathroom 1: Superb en suite wet room to the master bedroom with double sinks, drench head shower and WC. Bathroom 2: Modern shower room with large shower enclosure, wash basin and WC. On the decked terrace there is a large wooden table with benches seating 10 people, with additional loungers to soak up the sunshine. This is the ideal BBQ spot! A BBQ is provided. A large enclosed lawn is perfect for kicking a ball around, with wonderful views of the countryside beyond. An additional large decked area houses the hut tub - perfect for long, lazy days at home. Parking is available for 3 vehicles to the rear (narrow access between cottages). There is further unrestricted parking up the road for wider vehicles.